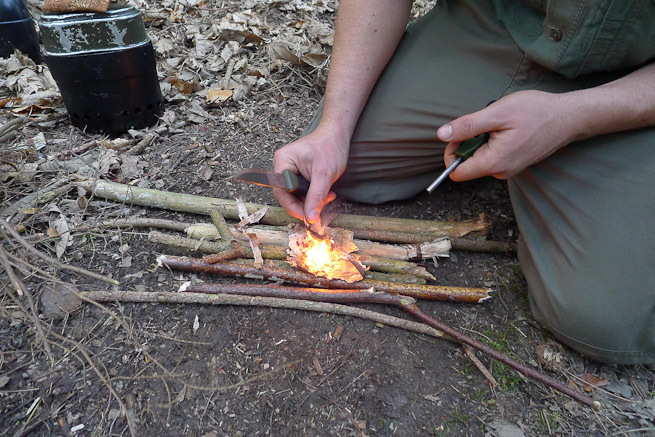 What equipment is available to the bushcraft beginner on a budget? Photo: Paul Kirtley. These days getting kitted out for camping in the woods can appear dauntingly expensive. There's a lot of pricey 'bushcraft kit' for sale but in reality you don’t need much equipment to get started with learning bushcraft skills. A knife, saw and fireflash is all you really need. But a beginner needs more than this to stay out in the woods overnight. So, I set myself a budget bushcraft challenge. I wanted to see if I could buy everything I needed to camp out in the woods for a budget of just £100. Do You Really Get What You Pay For With 'Bushcraft Kit'? Now let’s get one thing straight from the outset. I’m a big believer in having good quality gear. The old adage ‘buy cheap, buy twice’ is often true. But I’m also a believer in not spending more money than necessary. For me, decent kit does what it’s designed to do effectively, consistently and is hard wearing. That’s it. But buying decent kit can be expensive, and because many people who might be interested in bushcraft cannot afford to buy lots of pricey gear all at once, I wanted to find a way of putting together a beginners’ kit for a budget that pretty much anyone can afford. The point here is that a lack of money should not be a barrier to anyone enjoying the outdoors. And should the beginner become a novice and want to spend more time in the woods, then upgrading the kit can be done steadily over time, making it much easier on the wallet. The other big advantage with this approach is that you really get to know what kit works and doesn’t work for you. You know where it’s worth spending some money (e.g. decent boots) and where its not (sorry titanium spork enthusiasts – I just don’t get it!). This way one also avoids becoming the dreaded ‘all the gear – no idea’ walking cliché - something to be avoided at all costs in my book! So the aim was to buy everything someone who had no equipment would need to spend a night in the woods and do it on a modest budget. What Does the Bushcraft Beginner Need For an Overnight Camp? Now, from the off I realised that if I was going to do this article, it would only be right and proper to use the kit for a night or two myself to prove it was all up to standard. This was a great motivator to get it right! I began to source the kit by looking on various websites including eBay, to get an idea of what everything would cost. I quickly realised that with such a strict budget, there were a few things I had to compromise on. The most difficult item for me to find within budget was a sleeping bag – the only thing for the right price was a British Army Jungle bag, but I knew that for me anyway it would be too thin for 3-season camping in the UK so I carried on my search. From previous experience, I knew that my money would go much further investing in issued military kit instead of low quality leisure gear; my theory being that military equipment, although sometimes a little heavier, has been extensively researched and designed to do the job and to be durable. As many a squaddie will testify, not all issued army kit is great, but on the whole the theory is sound. This is in stark contrast to cheap and nasty leisure kit, often designed to look the part but with many corners cut to reduce the manufacturing costs as far as possible. After some time searching, I ended up with a kit that I was pretty confident would serve me well. The budget outfit that I assembled for less than £100. Photo: Paul Kirtley. *I reasoned that everyone has access to a bin bag and a spoon, so no point in buying one. 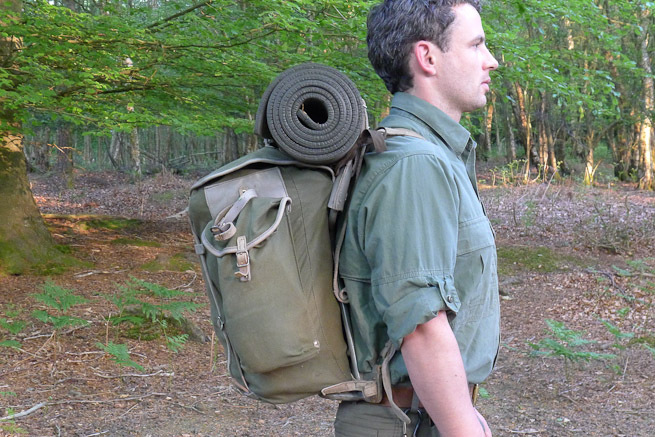 So How Did the Budget Bushcraft Kit Fare? Well, the first outing was a little ambitious. It was back in early March and I had promised Paul I’d get this article written up for a date that ended up being in the middle of a trip to Sierra Leone. I’d left the field test to the night before the flight. So I headed to the woods near my home on the wind blasted fells of the Lake District. I set up camp, wriggled into my bivvy bag and slept like a log. Until around 3am that is, at which time I woke up feeling colder than a penguin’s cold bits. With a plane to catch, a long journey ahead of me and knowing I wasn’t going back to sleep I conceded I was beat and headed home to a warm bed. At first I felt rather ashamed at falling at the first hurdle. But on reflection, my digital home weather station informed me the temperature had got down to around freezing that night as the heavy morning frost bore testament. After all, I wouldn’t necessarily have expected my normal 3-season sleeping bag to have kept me snug on a cold night like that. I would’ve used a thicker winter bag. So, not a failure. I used the kit again while working on a week-long Elementary Wilderness Bushcraft course in Sussex. This time the weather was a little more friendly and the kit worked really well in the woodland environment. The Mora knife I was already familiar with and it performed as you would expect. The saw was the unknown quantity amongst the cutting tools but this also performed well. The Highlander saw performed well. Photo: Paul Kirtley. At the first camp it didn’t take me long to get the tarp up and a fire lit (with the fire flash). The cooking pot made for a great billy can. I did find the fire flash quite tricky to use due to its small size and occasional reluctance to shower any sparks, but having said that – it did light my fire! The budget firesteel certainly did the job. Photo: Paul Kirtley. That night, the sleeping kit kept me warm and was certainly comparable to my 3 season sleeping bag and bivvy bag. I really like this sleeping system, the zip around the edge made it very easy to climb in and out of the swag and extra wool blankets could easily be added for extra warmth. The downside was that it is on the bulky side but it’s a great compromise for the money. My favourite buy was definitely the rucksack. Using this vintage pack proved why it has become a design classic. Despite being seriously durable, made with canvas, leather and steel tube, it was also very comfortable to wear fully loaded. With a treatment of cotton canvas proofer this rucksack would make a very practical addition to anyone’s kit! Norwegian 'Telemark' canvas rucksack on the author's back. Photo: Paul Kirtley. All in all the gear proved itself to be totally up to the challenge, and in many ways performed as well or very close to much pricier kit. Some things like the rucksack, tarp and sleeping bag were fine to use but were heavier and or bulkier than my normal gear. But this shouldn’t come as much of a surprise to anyone, and if I was new to bushcraft with a light wallet, I would certainly use this gear to get me out of the house and into the woods! What equipment bargains have you discovered or used? What recommendations would you give to a bushcraft beginner? Let us know in the comments below. 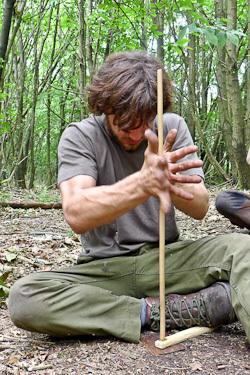 Ben Gray is a member of the Frontier Bushcraft instructional team and has been involved with the teaching of bushcraft since 2009. Based in a rugged part of Cumbria, Ben is an enthusiastic outdoorsman who particularly enjoys canoeing. Wow, with such a restraint it is incredible you managed to come up with such kit! If anything this shows not only exactly what the “cornerstone” items of kit should be, but also that there is really no excuses to get out into the woods!! Great article again, I really admire your approach to bushcraft – in particular a line in a previous article which said something to the effect that the point of bushcraft is to acquire less kit, not more! 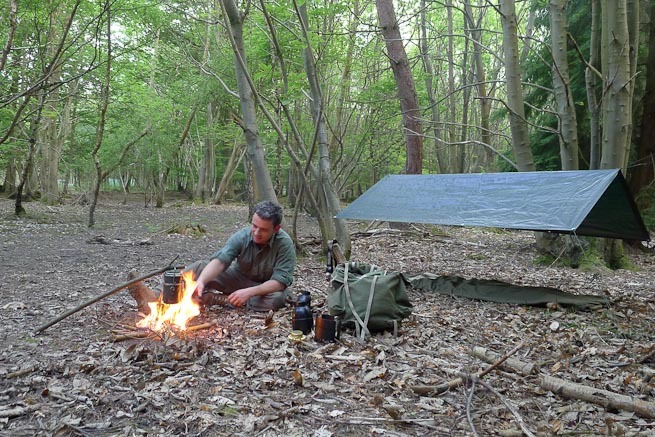 So much kit sold these days for bushcraft, when the ultimate goal is to be able to live from what is around you. Keep up the great work guys, I am hoping to come and do a course with you one day. Thanks for your comment. We feel it’s important to keep what is important in the proper perspective. It’s good to hear that you feel the same way too. Look forward to it Paul! I learn from you guys every time I read another article. Another quality article. Thanks guys. Good to hear from you. Hope all is well? This is the same kit almost that i started my bushcraft with over 25 year ago when i was a beginner. After watching Mr Mears on country tracks, i went out and spent the money i got from catching rabbits, and got this kit, and i still have it in the shed. I now carry the best kit i can buy, but for the beginner, this is the kit to get, and all for under £100, one or two item i would add to the list would be a small pocket book (collins gem) on mushrooms, toadstools and fungi and a small book on bushcraft/survival. Great article, I started with kit from army surplus and still use quite a bit of it. Thanks for the feedback. A lot of army surplus certainly lasts years and years. I cant stress the importance of using army kit. So many people rush off to the High-street and spend lots of money on average kit, then wonder why what they have just brought hasn’t quite met the mark. Glad you liked the article. I agree about not only using online shops – I did actually visit one of my local surplus shops (Military Mart) in person and chose some kit there – definately good to chose things in person and to make use of the shops owners who in my case were very helpful and patient! Tarp alternative – http://www.tarpflex.co.uk are very good, I bought a load of 2.4m x 3.0m tarps at less than £5 each for our Scouts bushcraft camp. I recommend buying Bahco Laplander’s from Amazon – they’ve gone up a little now, but still a bargain at £14.50! Tip for bushcraft beginner – eat a piece of cake just before going to bed, your budget sleeping bag will feel one season warmer – thermogenesis: heat generation from processing food, means you will sleep warmer. 3 very good points you raised there. Yes, a first aid kit is a must especially when using a knife and saw and would be the first addition to this kit. I haven’t come across tarpflex but for £5 that’s a great buy! The Highlander saw was an interesting one; although it did perform very well for cutting as it says in the article, I did find that when closed, due to the curve of the blade and handle, it does leave some teeth exposed – which could be nasty when fishing around in your rusksack. I think it probably is worth spending a bit more on a Bahco Laplander for this issue alone. Glad to hear you enjoyed Ben’s article. Thanks for the extra tips – what make was the saw you got for £2.99? Hi Paul, I found my folding saw in Wilkinsons, they make budget goods under the brand name “Wilco”, it cost me £3.99 a few years ago and gets used a lot, for tasks in the garden to turning 6` logs into grate size for the fire in the house. Unfortunately I am no longer able to go wild-camping due to disability. however every time i read one of the team`s articles it transports me back wonderfully. Many thanks, keep safe and keep up the sharing, Dave. Loved the article and the links ti sites I’ve not come across before. I was on a survival course about 6-8 weeks ago and found my Boar knife sharp but lacking in weight for some of the jobs I needed to do. I had been told about a Dog Legged Machete that was a great alrounder as an alternative to my current knife, but…I was looking to be paying £125 for one in the UK. There is a Chinese manufacturer’s website called Aliexpress, where you can buy from them directly…cutting out so many middle men and there mark-up’s. I got my new knife for around £25 and what a cracking piece of kit! In my search on their site they were also selling the Gerber Bear Grylls knives from as little as £6 compared to £36 in the UK. So, if you are prepared to wait the 2-3 weeks for delivery(which is usually free too), Aliexpress is a great place to source some of your kit. And as most of the things we buy these days are made in China anyway, why not get it dirctly from the manufacturer. Thanks for your comment – interesting reading. Just a pointer about Alliexpress. When it comes to those low prices the reason behind them is that they are by and large selling fake goods. To be fair some of it not bad quality but I would not recommend them on a site like this. You can get a British Army bag for under £35 on some websites. Bulky and heavy yes, but able to cope in winter? Yes if you adapt the bag with some more down around the feet and leg areas. Any fire lighting kit can be made cheap. Vaseline on cotton wool balls and a Zippo will work and stay lit even in some less than suitable conditions. Tarps can be got from Wickes or Screw fix for cheap. Any knife like the Bear Grylls one can be expensive but are worth it on the low cost side. In all, most of what was gotten was worth the money. I would have gone for aliminium bottles and just wrapped enverything up in the tarp and used that slung on my back as a backpack (the way old sailors used to do to carry their kit about). With the tarp waterproof you do not need to have everything in a backpack when you have your shelter on your back itself. (my idiot top tip). Very useful as I’m planning a trip with some friends to go wild camping in Galloway Forest Park in Scotland in September. It’s going to be my first wild camping using tarp/bivvy. How much did the whole kit weigh? Was there any room in the pack after packing it? What are your thoughts on the Czech army bed roll ( http://www.militarymart.co.uk/index.php?_a=product&product_id=1772 ) ? Is it meant to be used without a sleeping bag? Will it be warm enough? Thanks for your comments. To be honest, I’m not sure how much the kit weighed – but it wasn’t so heavy that I would worry about it, it really was surprisingly comfortable on my back. In terms of extra space – yes there was some room, enough for a spare change of clothes. So if you only take what you REALLY need, then you’d be fine with this kit. Its the easiest thing in the world when packing to just keep adding things you think you ‘might’ need, but then you end up dragging an almighty pack with you and that’s no fun! Its all about trial end error. If you go on a few trips and find on your return home that you didn’t wear half of the clothes you packed and didn’t really need 4 knives and 7 torches, then you know what to pack for next time. Good luck and have a great trip in the Galloway Forest! The Czech army bed roll looks the same as the Belgian one I used. Its a complete system so it doesn’t require a sleeping bag. Generally I was impressed with it, although I’m not sure it would be as waterproof as the British Army Goretex bivy bag I normally use. But if you sleep under a tarp this shouldn’t be a problem. As to whether or not its warm enough, it really depends on how warm you sleep (i.e. are you generally warm or cold compared with other people) and what the weather will be like. I don’t know the answer to either of these, but I can say that in my opinion it compares well with a 3 season sleeping bag for normal British use (i.e. not in -40 arctic conditions). I would suggest if you were to buy the kit to test it, even in your back yard, before taking it out to the forest with you – just incase its not warm enough- that way you can’t blame me if you’re cold!! Query about the Czech bed roll: I bought one but cannot get it into such a small rucksack. Excellent. Every picture makes me want to get back up to Dartmoor for a weekend. The simple (and cheap) nature of the article i hope is an inspiration to many people who have thought about giving something similar a go but may have been put off by the myriad of different products, the potential cost and the ‘elitism’ so often encountered in bushcraft. first of, great post. Ben was able to make an excelent kit on a very low budget. since Paul challanged me to add to the post, here are some alternatives that can make the kit even cheaper. This is more for kids, that are less oriented into buying and have no shame of asking, reusing and improvising. pan set – chinese inox pots sell for 3€ a piece. or use an old hobo style can with wire hanger for free. headlamp – no better deal than the one mentioned. Metal Spoon – free from home. Heavy Duty Plastic Tarp – again construction sites, used to cover sand and other perishables from the rain….free and often left behind when construction finishes, just ask for it. Total: 31,70€ in portuguese euros, so add 10 more for GB price differences. this was very common set amongst scouts 50 years ago, when a sleeping bag was a luxury. 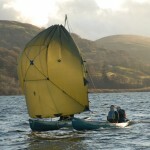 It shows you can could do it for less than £100, particularly if you make some of your own kit. But beginners don’t always have the confidence to do this. We wanted to make it as easy and accessible for people to get into the woods. For the beginner who is on a super-tight budget or who is willing to go to a bit more effort to source cast-offs or materials to fashion their own kit, there are some good tips in your comment. It is a question of good stile. If I would find on our land a group of adult people in yellow Aldi plastic tents in orange jackets, white sport shoes and bright blue shirts, I would ask them kindly to leave my land within the next 30 Minutes and would tell them the way to the next camping ground. If I would find on my land a group of 2, 4, or 6 young people in hunting green, brown and (short) beige clothing with an interesting collection of old military equipment in green tents and tarps sitting around a small cooking fire in a corner next to the forest, I would invite them to stay as long as they want. I have practiced wildcamping for more than 30 years in Germany and France most times, in both countries wild camping is strictly forbitten. I never met an angry man in the forest and field. And even those who had been payed as rangers told me friendly where their official national forest was ending and gave me tips for the next lovely wild camping spots! So the stile is important! But if you are young, poor and beginning you should start with the equipment you can find for free. As long as you carry your waterbottel in the darkness of the sidepocket of your rucksack 2 old plastic waterbottels of 1 liter from the supermarket are ok, you dont have to colour them black. People who feed animals with hey in bundels in recktangel form throw every day away strong cordage which is not perfect, but ok for the beginning. Farmers store hey in round large bundels with a useless netting around but people who own privatly one or two horses or 20 rabbits use that smaller rectangled hey bundels. They collect that cordage where they open the bundles till they throw them away in one rush, when the place to store it is full. With the yoga matresses you have to pay attention if you are not living in Portugal, they often have open cell foam, like a kitchen spong, not closed cell foam, like a propper insulation matress. Most yoga matresses become in cause of that inside wet and heavy if you try to insulate yourself against a wet ground. They are only an option in mediteranien circumstances to protect against small stones on the ground in areas and times, where no rain is falling. How to sleep outside in two woolen blankets? The outer you fold in the lengh in two and a half parts and wrap it around you in the end. Like that also around your sleeping bag to protect it against sparks from the fire if you have to burn pine or other conifere threes. (Attention: Every pineforest southern than Rostock you can easily burn down in summer conditions. The needels burn in the earth, you can not see it from outside, the next wind burns down the forest!) the inner blanket you lay diagonal over the (open) outer one. You fold a triangel of 40 cm over your feed , that is the bottom and replaces the boots, than you fold the next smaller triangel over your legs, than the last around the legs. So that forms all together a short sleeping bag that you push with its upper end in your coat you are wearing. Your trousers you are also wearing. The old school way is the most comfortable way, if it is done right. An old sheeps skin under you should lay on a poncho or small buildingside plastic or binbag, to keap it dry is as good as a insulation matress in frosty conditions, which are dry, not wet. An old woolen wintercoat is for people, that use a fire better than a mountaineering goretexjacket. You protect it on the march against water with your militarypocho. Its most times grey like the ground, and blends in the forest often better than green. In frosty conditions you can use two or three summer sleeping bags, that you can pick up for free easier than an expedition winter sleeping bag. You pull simply the smaller one in the larger one and thats fine. 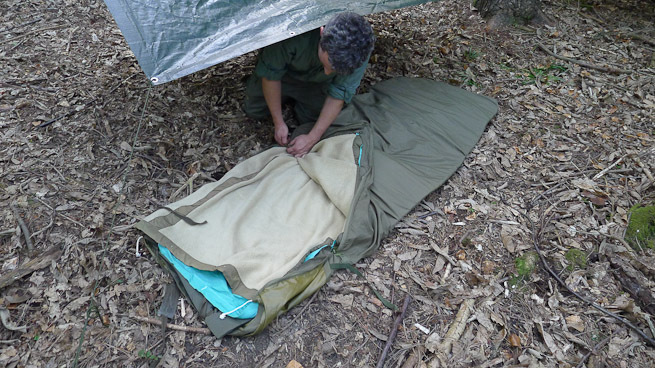 The military sleeping systems are working like that, you roll all together and fix it on top of your rucksack, but you should do it in a propper large dry bag. In my opinion the first real investment should be a british military bivibag, a goretex sleeping bag cover, you can get used for 40€, and a militarypocho used for 20 €, that you normally do not find easy for free, and that is high quality stuff you need, if it is cold and wet. If you dont get a nice rucksack for free, what is possible, such a norwegian one or an other original tough military rucksack is nessecary too. The other equiptment for young beginners should be old cowboys equiptment you get everywere for free if you tell people about your project, especially old people own the real good old woolen, canvas and leather stuff, the historic traditional old woodsmans equipment you need by sleeping next to a fire, and they cant use it any more, because they are to old for hiking, they will love to give it to you, because with you a part of their live returns back to the great adventure! Thank them with printed out fotos from your camps and their friends will surch more equipment for you and your friends! Dont be ashamed to ask old people, many of them spare the stuff you need for people like you, because they got their equipment, when they have been young from older people too. In the equipment lists of that blogs are missing leather working gloves you need for work as a beginner with the saw, you should protect your hands! And they are usefull if you grip your hot pot. A cotton hankerchif cowboys do not use to clean the nose, its for the kitchen work too! Best regards and have a nice time in the woods! I don’t feel to guilty with my kit, i have just a 35L Pack & thats all i need for kit. A person soon finds out what you don’t really need & your just packing around weight ! lol. I still have room in my pack, its only a bit over half space used. So still room for another layer of cloths,gloves, in the Fall / Winter season. Im also getting rid of my tarp soon & getting a really nice Poncho / Tarp. It will serve me in 2 ways, keep me dry & my pack. And after a fire & shelter are made can use the poncho as ground cover or a leaky roof, lol. It sounds like you have your kit nicely honed down. It also serves to illustrate the important point that familiarity with your kit and its use also means that you will carry fewer superfluous items. I own pretty much all the same gear you have used Ben and actually prefer most of it. I have to say the Norwegian canvas pack I bought is very nice indeed. Mine was unissued and looked like it had been made yesterday. For £25 i cant imagine why folks buy the £200 odd modern canvas ones. I swapped the buttoned in blanket and sheet in the swag with a second hand snugpack sleeping bag that cost £5 off a mate. Warm as toast most of the time, and if it drops during the night just add a layer and eat something. The Plastic army bottles are great as a hot waterbottle when just sleeping in a blanket. I wake up halfway through the night to stoke the fire in cold weather. When I do, I have a brew and fill the water bottle with hot water, cover it with a sock and pop in down my front. Looking around, asking advice from ex service men, and making or adjusting kit, can save you a lot of money and give you a sense of satisfaction. Then you can get on and practice skills in the woods. I agree with Paul, these swag packs are great but very bulky and heavy. I’m amazed it fitted in the pack. Replacing the sheet and blanket with a sleeping back is good, rolls up smaller and easier to get out of for that early morning call of nature than a bivvy bag. Great article all the same. Well done Ben. Tried and tested is the way to prove it really works. £100 isn’t so much nowadays to get you out there. Skills to keep you there in comfort and safety are priceless. @ Paul – love the idea of the hot waterbottle! Thanks for your feedback Stephen! Cant beat the mora knife and bahco laplander saw – dont compromise! An alternative to the army water bottles is the Stanley SINGLE-WALLED stainless steel water flask (costs a little more around £15) – can be put direct onto open fire so can boil / treat your water; perhaps replace one of the army bottled with this? Just want to say, yet another excellent article, One thing I include in kit, that never gets any kind of mention is my wind up led head torch and my other wind up torches. saves space and saves on battery cost, Also no need to add to the land fill with disposed of batteries. Win, win! Good to hear from you and thank for your feedback on Ben’s article. That’s a good point about head-torch batteries – even modern LED torches, which are much more efficient than the torches I used in my younger days, do go through batteries if you are outdoors a lot. The cost of this (monetary and environmental) does indeed add up. That’s great Joseph – Let us know what you think. I reckon you’ll be pleased! Re the highlander saw, over the last year or so i have purchased and used around the garden and taken on my green lane & camping trips a folding saw from ALDI it has performed well and still does and cant remember the price exactly not much more than a fiver comes to mind. i do have a Bacho one in a leather sheath but my aldi one gets the lions share of the work as i dont mind if it gets abused or damaged a bit like your Moira knife. Good to hear from you and thanks for the feedback on the longevity and robustness of the Highlander saw 🙂 It will be reassuring for people to know they last well. Good article. Whilst you professionals quite rightly use top notch gear (as you’ve mentioned before) the cost of kit is always a consideration for the lighter wallet and indeed, you’ve shown that inexpensive can be good for those with cash to burn. I’ve been through all the comments and I don’t think anyone has mentioned a length of heavy duty sticky tape around the bottle for emergencies which is inexpensive and useful. Just wanted to add that I’ve had great service as well as great products at great prices from Endicotts surplus in Exeter. A great place for Bushcraft Kit on a budget. I don’t live local to them but wish I could have a good rummage around in their shop. Although I feel I might overspend ANY budget!! Thank you Paul and Ben for showing the world that you don’t need all the gadgets and up-to-date kit to go wandering and learn bushcraft. Now taking your motto of “Less is More” approach. Less kit one has the more knowledge a person learns to keep themselves whole. Well done guys. Keep up the good work. Thanks David. Looking forward to seeing you soon! Hi Ben, Great article and i’m glad all the kit we sold you worked well for your purpose. Its always great reading how people review kit as everyone has different views on different items. It was great meeting you & listening to your views on bushcraft. Thanks again for you help and advice! thanks for the article, it was highly informative and interesting, as im just starting out it was great to find out i dont have to spend a fortune, i have bought some of the items you recommended and im made with them . one question tho , did you stow the sleeping roll in your bag or tie it on the outside? The sleeping mat is rolled and stowed on the outside of the pack. The rest of the sleeping kit was packed inside the main compartment of the rucksack. Great article, which prompted another thought in my head – can you assemble all the clothing you need for £100 (boots, socks, trousers, shirt, jacket, waterproofs, hat)? Bushcraft on a budget#2? If you do not want to use camouflage patterns, you can look for used german military underwear, austrian uniforms and hunting and trekking clothing from Decathlon with shops and website in britain too. I did not try out very much Decathlon hunting clothes, but everything for trekking and Camping I used was absolutly ok for that price. Since years I buy the light flat summer hiking sport shoes for 12,50€ each first may and walk 15 km each day and change the 15 th oktober in my military boots. For a second season they woud be too destroied in the foam, but I have 90 kg and walk a lot ! The tent for 25 € is ok if you dont go in the mountains or other dangerous areas. The zipp of trousers in beige are good but light, the plastic-cotton mix hunting trousers are since half a year ok for 30 €. Only the buttons you have to fix. Kirtley could try that matreials out with faster result than me, I can tell it you in december 2017, because from time to time I am working in offices, and normaly do not go through the bush, i go more around. Hi just read this great little article. As someone who is considering dipping my toe into the world of bushcraft this article is of great intrest as I am wondering what kit to get without wasting hundreds of pounds on expensive gear. Really like the idea of a homemade billy can!! Any tips on reading material and websites greatly appreciated thanks. Try looking in charity shops they have bits and bobs you can make into billy cans etc and are very cheap . Great article many thanks, god bless Army Surplus huh? have gotten my moneys worth out of it over the years and totally agree that issued army kit is often a lot better then cheap designer kit. I do often take full advantage of the discounts I get at various stores by being a search and rescue technician, district Scout leader, BCU Member etc etc, this 10 – 20% often makes the difference between being affordable or not for me. +1 for the pound shops! Thanks for your comment. As well as the great heads-up for what you can get in pound shops, I think your point about various discounts that memberships offer is a good one, often forgotten by people looking for bargains. Over the years my BCU and BMC memberships have more than paid for themselves with the discounts achieved on clothing and equipment. Great article and a very good point about military surplus kit. I’ve just joined the Territorial Army after 8 years away from the military and I’m gobsmacked how teh standard of kit has come along. As far as clothing goes , surplus is great but for civvy outdoors stuff I try not to look like a soldier. WHat I would liek to see is an article about non cammo bush/survival clothing for under £100. Thanks for your comment. Good point regarding camouflage clothing. Some people are OK with it and it certainly has it’s place for stalking and wildlife watching but many don’t want to look like a soldier while out camping. Great article guys. This makes bushcraft much more obtainable to those on a lower budget! On the introduction to bushcraft I did last year we used fabric water filters. I’ve been searching for these online everywhere but no luck. Do they have a specific name or do you know where I could find one? Good to hear from you. Adam has beaten me to it with a reminder of the name of Millbank bags. They turn up on ebay from time to time. Not as cheap as you’d think. I’ve heard you can make your own from the bottom of a jeans trouser leg. Be surprised if you can’t find a tutorial on it online. Indeed Richard, if you need to remove suspended matter from water and don’t have a coarse filter such as a Millbank bag, take off your trousers, tightly tie off the bottom of a let and run the water through the lower part of the trouser leg. Obviously, the effectiveness of the trouser leg depends on the denier of the material. But if it is quite fine, it will work well. I can’t see any reason why you couldn’t make an equivalent to a Millbank bag if you got hold of the right material. Could the fabric water filter be called a Milbank bag? I remeber seeing some of these in the 80s and have long been searching for them. Anyone got an idea where these are available or do they still exist? Thats the one! Thanks Adam. There are is one on eBay now for £7.50 but that is all I can find. £7.50 is a good price. They are not easy to come by these days. I think these are a must have item because as my girlfriend says , whats the most likely natural disaster in the UK? Flooding. Alot of water but not fit to drink. I would seriously reiterate what Paul says ,they are not sterilization devices but they sure make sterilized water taste and look a lot better than earthy brown fluid. With reference to good quality cheap survival clothing, how would you all rate the M65 jackets? I’m a great fan of waterproofing clothing to give you a good all round jacket. Do the froum readers have any preference for a particular surplus jacket /boots etc? I’ve never tried the M65, so can’t comment. Feldjacke leicht, Österreichisches Bundesheer , Goretex, olive green, around 700 g … is US M 65 . I bought mine 5 years ago, produced by Feuchter, Ringelai. My jacket is perfect! (40 € i paied) . So if you like one look for it in Austria! No thats fair comment Paul, especially about the repro ones. I’ve only used mine to go shooting andcomfort travelling in BC Canada. I’ve not given it some serious testing out on Dartmoor or the Beacons in spring. The m65 is or was in use also in Austria. You can find 65 % plastic 35% cotton webbing 1 Kilogramm jackets in dark olive green. The Name is: Feldjacke Österreichisches Bundesheer. This I dont know. But I own that in the newer version light, in german “leicht” my is in goretex fabric, I payed perhaps in 2010 around 40€. May be 700 g. My is produced 1995 by Feuchter, Ringelai, who delivers to the german army too. My jacket is perfect! It fits very well over normal winter fleece jacket. The jacket has a lining and inner pocket. In the collar is a thin small hood on civil size. Last week of december 2016 I bought a used german Bundeswehr flecktarn goretex Nässeschutzanzug. Produced by Feuchter too. The very large hood fits over the insolated hood of the old green parka (feldjacke). The size of jacket and trousers is large! If we would have to defend our country against a russian attac in january we would have to count with negative 25* Celsius in eastern germanys nights, so under the cottonparka and over the cotton trousers fits in the Kälteschutzanzug, a quilted suit warm and thik like a summer sleeping bag! But what Ibought was nearly new! And very light! And 45 € together for jacket and trousers was a price that convinced me! The camo pattern blends in green forest vegetation better than every other old camo, only atacs fg cuts the shape at the same level. My camp is in flecktarn, my clothes I prefere in green, because i use them in the city too. But the raincoat? Is more for forest use. Doesnt matter! Great article and was pleased to see so much kit from MilitaryMart, as this where I get a lot of my kit. I agree ex-military gear is great, as it has been already tested to the max. I love the swedish army trangia, so cheap. I also like to have a go at making my own kit sometimes. Which can be great little projects, saves you money and means you HAVE to go out into the woods to give it a proper testing. How much do these items weigh? Collectively & the main components? ? Pack, bag and tarp. Good article & blot. Thanks!!! Hi I bought the Czech roll from mil mart a year ago but I can’t tell if I purity together right cause everyone says it’s warm I find my jacket better could you show me how you did yours please… Does a liner make any difference.? I’ll leave Ben to explain the use of the roll in full but just to comment on liners – yes they will typically improve the warmth of a sleep system. Just got to say this forum is great for 3 reasons. It talks sense about kit that is affordable, it is British and not american (and continually banging on about weaponry) and the contributers are the folk who have walked the walk and talk the talk, no arm chair kit junkies. I took my girl friend out for a weekend of survival skills in a woodland owned by a friend. She took to it very well and even brought her .22 rifle to crack off a few shots. One thing she could not get to grips with was mummy sleeping bags. She just can’t get a grip on the standard type of military mummy bag. Do any of you know any military surplus or small packing lightweight bags that are rectangular bags? Sounds like you had a good time. I’m not aware of any particular rectangular military bags but it will likely be worth having a look in a store that concentrates on family camping in large tents and caravans. They often have rectangular bags. I need your advice here folks. Recently I took my girlfriend to a friends woodlands for a weekend of bushcraft skills and survival aclimitisation. She used a British army mummy bag but hated the mummy shape of it. She wants a rectangle bag that is warm and at 53 she wants it light enough to carry around in her bug out bag. I’m totally stumped after hours on the internet. What do you suggest? I had the same issue a few weeks ago with my mummy bag so went to GO Outdoors where I found quite a few rectangular bags, ranging from £20+. I bought the Outwell 1900 for £30 in the sale, which I have already used for seven nights’ worth of warm, sound kipping. It’s rectangular, can be zipped together with another for very friendly sleeping, has a detachable pillow and comes in a wonderful 70’s dog-do brown. It doesn’t pack up ever so small, but they have some that do. Good luck. Good advice. Many thanks for helping out with answering this question. I have just returned from the Frontier Elementary bushcraft course, which I have to say……was Wonderul! – I learnt an amazing amount and also confirmed that I knew more than I thought too. I thought I would add my input here into the equipment as I basically used a very similar setup which was almost 100% sourced via Military Mart. The telemark rucksack – £17.50 – great bag and very stable to carry as well as put down as it stands up due to it’s frame – You get good space in there too. Nice and sturdy. I purchased the Czech army bivvy bag too, which at £9.99! – You can’t really complain. I would describe myself as a medium warm sleeper and found that on the first night in my tent I was a little cold just using the bag with inner blanket. Not terrible though, just a bit chillier than you might like. I then started to put my cheap as chips Argos sleeping bag inside the bivvy bag when I was sleeping under the tarp for a few nights and this was lovely and warm! Too hot infact for some of the time. I agree that the drawback is that the bivvy bag is quite heavy when fully setup with all its inner linings and hygiene layers buttoned in, but for the price it’s a brilliant bit of kit! You could always take out the inner wool blanket and just button in the cotton hygiene layer and put a lightweight sleeping bag inside it to reduce weight? Otherwise Mora knives are great to work with and I was borrowing the supplied Bahco Laplander saw from Frontier, which proved to be a worthy bit of kit! All my gear which I won’t list here came to under £120 for the lot. Oh and thanks again to Paul, James, Susan and Matt + Ray for an absolutely fantastic course and adventure! – A great team. Thanks for your feedback on the course and for taking the time to write your thoughts on the equipment you used. This will, no doubt, be useful to future Elementary course participants. Great to have your thoughts on the kit and really glad you enjoyed your Elementary course. Good ideas too about using a lightweight bag, as you say that should bring down the weight a fair amount. The rucksack I used was given away in a Frontier competition, I was sorry to see it go! It might well go on the Christmas list this year. Thanks again and I hope to see you on your next Frontier course. Wonderful article. Here in the states, the only differences would be the currency conversion. That being said, I still feel that your costs were good. I recently purchased a rubberized French military surplus rucksack. Its a little larger than the norwegian you purchased and has several compartments. Alot of the other items in my kit I’ve purchased at thrift stores. Those local to me have knives at $1 to $2. I have also gotten sponed at 10 cents each. Stainless steel cookware (with missing lids) for $1 to $3 each, depending on size. Aluminum for similar prices. The other items that I have I have purchased at higher cost. My firesteel was given to me by a friend, but I also carry a butane lighter, which is very inexpensive. Thanks for your comment. It’s interesting to read of your experiences in finding budget equipment on the other side of the Atlantic. It seems wherever you are, it is possible to equip and outfit yourself at a reasonable cost. Surely what matters is the content and validity of the info in the post and not how it is spelt. Remember , even Winston Churchill was a dyslexic. Has anyone here used either Bodmin or Dartmoor for training or outdoor equipment testing? If so do you have any favorite locations on either of these 2. I like a location where you can get yourself into nature and relative isolation but if your new bit of excellent it turns out to be as waterproof as a tea bag and as strong as a paper bag, you can easily hike out the next morning. What a great article. I’ve recently started taking an interest in bushcraft and wanted to try camping with a tarp, but haven’t been confident about choice of equipment and also the cost of some of the gear makes it prohibitive for me. After reading this as well as the input from other experienced readers I feel more confident about giving it a go and won’t have to explain to my wife why I have remortgaged the house to sleep outside. Let us know how you got on with your first trip out. Me and my partner tried a bit of tarp setting up recently for 2 nights. We have added the camo net to our kit for a different reason. It was great at shading us from the searing heat. We were exposed to a survival risk I hadn’t considered in the UK, heat. It was the same weekend of the sad death of the 2 guys going for the SAS. It strikes me now how much, in a survival situation, lack of shade, sun protection and water, can kill as if we were in Sudan or the Outback of Australia. She bought me a camal hydration pack recently and we are going into water purification more. We are also picking up those big clear plastic containers water comes in from the super market. We get them from community recycling points, and sterilze them of course. The idea is that we will fill these and keep them at work, bug out locations in each of our vehicles and around the house should we get a ‘bug in’ situation. I first read this article some time ago but have stumbled across it again. I think this is an excellent article and proves you don’t need to spend a fortune, when I started going out bushcrafting all my kit was scrounged from the house or my Grandfathers shed. 20 years on I am guilty of spending a lot of money on good kit but I do still use a lot of army surplus gear ( I’ve just had to replace my bivvy bag after a stupid incident with a bag not packed very well and an axe mask not put on properly, bought an ex issue British army bivvy bag, £35 for a gore-tex bag that doesn’t look like it ever been used). Over the years I’ve had great pleasure from making my own kit as well, why spend stupid money on a titanium spork when you can easily carve one, at least if you lose it you haven’t lost any money and you have the joy of carving a new one. I saw on an earlier entry about millbank bags being hard to get, the MOD are selling them all off, a local army surplus store has hundreds of them. As always, it’s good to hear from you and what you write here makes sense. Thanks for sharing the heads-up re the availability of Millbank bags. Thanks James, I’ll get on the case and start searching for a Mill bank bag. Sorry to be a bore but I can’t stress enough how dirty water can seriously incapacitate and even kill in disaster situation whether you are in the tropics, Temperate area or artic zones. Great forum, keep the chat going folks. Can you offer any advice regarding safety when using a tarp among/under trees? I appreciate common sense plays a part when picking a spot but wanted to know if there is anything else I should be looking out for at this time of year so I don’t end up under a big branch. Great website by the way and will be looking to book up on one if your courses. Hi Andy, thanks for your comment and your kind words about our website. Common sense is, of course, invaluable in the outdoors. Look out for trip hazards around your site before it gets dark. Look out for small banches at or near eye height near your tarp, especially any that are close to wherw you get into/out of your tarp. Note your peripheral vision is not always as good when using a head-torch. Stay safe and hope to see you in the woods soon. Not Belgian, but Czech bedroll sleeping system. Just got back from a trip round Croatia, Bosnia and Montenegro. The weather ranged from very hot and sunny to downpours. I used my British Army 58 pattern GS Bergan without the frame. It was fantastic. I fear they are quiet old now so not many will be on the surplus scene. I picked mine up for £15. Totally waterproof, hardwearing, padded back and about 50 lt internal capacity with 3 external pockets. Anyone else got experiecne of this bag or similar they would like to share? Incidentally, I met some Bosnian and Croats who said during the independence wars , they had to scour German Surplus stores to equip their newly formed armies. Can you guess what kit turned out to be the preferable? Well just bought a DD 3×3 Tarp sheet, so really all I am left to source now is a decent lightweight sleeping bag. i.e. under 1.3KG and packs down smallish. Really I am after 3/4 season and under £100 quid! I was advised that your sleeping bag is something you should avoid scrimping on, but it is one of the more difficult bits of kit to source which is actually up to the task. I love my Czech army bag, but it’s seriously heavy and pretty big too! Thanks for your comment. It’s good to hear you are getting well kitted-out. I agree that a good night’s sleep is worth its weight in gold. You are going to have a hard time finding a bag that both weighs less than 1.3kg and extends to 4 seasons (UK) and costs less than £100. A down bag will give you the performance-weight ratio but at a higher price; a synthetic bag will give you the warmth-price ratio but for a higher weight. For your needs I’d be looking at the Genesis 2 or 3, depending on how warm you sleep. If your budget is even more limited, have a look at the Snugpak Travelpak 4. I hope this helps. Let me know how you get on and which bag you choose, even if it isn’t one of these. Thanks a lot for the advice. Before I read this comment I had already gone for the Gelert Xtreme Lite 1200. I intend to use the outer layer of my Czech army bivvy bag with the sleeping bag inside. I will try removing the inner wool blanket from the bivvy bag for weight advantage. The sleeping bag is meant to be 1.2kg, but is probably closer to 1.4kg with the compression bag. However at £45 it does come with excellent reviews as a budget option. I agree however that if I travel into more extreme climates ( Canada or Sweden perhaps) I would opt to pay a bit more for a Rab maybe. Having said that I shall be giving it a good test hopefully this winter just to see how it holds up. I shall make sure I have a full meal before I hit the sack! Saving my pennies for an intermediate course now! I’ve just bought the Snugpak The Navigator RZ from Trekkit for only £22.50 for my girl friend. OK its only a 3 season bag but add Tesco Sleeping Bag Liner at £7 and shes got an excellent lightweight 4 season sleeping system for under £30. That sounds like a real bargain. I will be interested to hear how it holds up in the outdoors. I firmly believe that it is possible to keep warm and dry for a low budget. It is run by a Astro Physicist called Piers Corbyn. Now his long range forecast reckons that it could be really quite warm and dry between 20-23rd of November! A splash of ‘Indian Summer’. Thanks so much for the site. Accurate weather forecasts are essential to me, as I spend nearly all my spare time outdoors. Just a postscript on the liner . Get teh £10 green fleecy one as Ive just found out the £7 one is nothing more than a sheet liner, littleuse in up rating a sleeping bag. Thanks for your comment. I hope you find some useful information here – both in the article and in the comments. Please just ask if you have questions. Cheers guys, thanks again for all the great info (in the article and the replies). Thanks for your comment and adding more information to the conversation. I’m glad Ben’s article was so useful too you. Thanks for helping me to see things in a difefrent light. coming yet again to read additional news. Thanks for the message and info about your breakfast. I have had my breakfast already. First of all, I want to thank you, Paul et all for all your posts. I am a constant reader and your recommendations have served me well in pursuing my bush craft adventures. I reget I’m in the US and don’t have an opportunity to take one of your classes. I have a question about the Czech Army sleeping bag. I also love this bag, and along with a wool blanket (as I like to sleep cold), it’s 4 season bag for me. Thanks for your message, I’m really pleased the articles have been useful to you! Regarding your question about how I packed the bed roll – to be honest I don’t completely remember as it was over two years ago and I wasn’t blessed with the best memory… But I’m pretty sure that I folded the bag once lengthways, then rolled it up very tightly. I can tell you that in the photo of me with the rucksack on my back, it contained all of the kit described in the article, so it does definitely fit in the bag. As you can see, the only part on the outside of the pack was the sleeping mat, which is made from closed cell foam and therefore would not soak u any water if it rained. Sorry I can’t be more helpful. And hopefully we’ll see you on one of the Canadian canoe expeditions before long! This week me and my girlfriend got out into a friends woodland to try out sone techniques and kit. Just would like to give a bit of negative feedback on the ex dutch army two half shelter. This comes in two small packs to be carried between 2 people. The idea is that the shelter halves button together and form a 2 person pup tent. The pegs and poles are divided between the 2 pouches. 1.The double button arrangement is not water tight unless its pulled tight on the guy ropes and the rain ls vertical. 2. While not being heavy the poles and pegs have no advantage over a good basher and para cord. 3. The shelter halves are useless as a poncho or shelter on their own. 4. The system reluse on you and your buddy always being together. You can’t beat poncho , bivvy bag and paracord. Thanks for your feedback on the Dutch Army setup. It’s not something I am familiar with so I’ll take your word for it! I love the simple basha/bivvy combination, it’s hard to beat for versatility, practicality and pack weight. Just a postscript, I think its Austrian not Dutch. If anyone wants the system I speak of , email me and I will send it to them if they cover postage and packaging. That tent was constructed as a raincoat! You need the hood to button it in the connection section. Used as a tent it is storm resistant, what is usefull in Austria. Unconnected and errected on a 60 degree V angel like two lean two poncho shelters with a small fire in the middle with the entrance against the wind in combination with bivi bags that is in cold conditions a very good and cheap solution. You should errect it a little bit more flat, than the connected shape. The german tent is from cotton, the austrian rubber coated nylon or poliester, that i dont know. But i know that in cold and windy conditions that tent is far more comfortable than a poncho, in my opinion the perfect solution for two friends who do not sleep arm in arm! The shape is low, the fire is invisible too, you have a heated room. If you learn to feed the fire in the night without awaking to much, what is easier when the sleeping bag is a bit thinner, than it should be without fire, or not closed, that is my favorite option after a 4 to 8 persons black cotton tent called Pfadfinder-Kohte, what is a closed tippi with large whole in the top for the smoke and steam out of the large cooking pot that belongs over the fire. The bushcraft stile errected Austrian tent is the little sister for two persons of that german boy scout tent, which was constructed in the twenties as a portable light version of the Sami Kotta from northern Skandinavia. You should give your tent a second chance the first weekend in march or april. Howdy! This post couldn’t be written any better! Looking at this post reminds me of my previous roommate! Fairly certain he’ll have a great read. Thank you for sharing! Excellent article would be great to see it with an accompanying video using the discount bushcraft kit on an overnighter . Thanks Lex, glad you found this useful. Good idea regarding the video. …did you see the film ‘A Night In The Woods’ I made? We didn’t weight the kit, so I don’t know. There was no target weight. It wasn’t the goal. We were very constrained on budget so it was going to weigh what it weighs. But in retropsect, it would have been useful to weight it just so we knew. I think you’d struggle to get this kit into a 35 litre pack unless you put a lot of it on the outside, which is defeating the object. If you can, get a bigger pack and then you have much more flexibility year round to pack what you need. I think the question of weight should only apply if you.intend to.yomp miles with it, not just get yourself to a place of shelter where you set up. Or am.I wrong? One of the best value for money items i carry and its really light is the Gel Fuel Stove. No bug out bag or car boot should be without one. I hope to meet many of you as possible at the Wilderness Gathering. If you are going , post here and we can arrange a beer tent meet up. B +M home stores are now doing hexi burners with fuel for just £1. Get down there and stock up. Great article, for a long time now I have used my folding saw and knife to do all my cutting, but after a while I started having thoughts of adding a axe to my Arsenal. So instead of committing to buying a branded bushcraft axe I went to my local what store and purchased a very budget axe for £5.99 just to take with me into the woods for a few trips to see if I would use an axe etc. And it’s fair to say that I have had this same axe now for 2 years I use it a lot and it’s stood up to everything I have thrown at it. So for the sake of £5.99 a beginner can start off with axe also. A reasonable axe with a well kept edge , you can’t go wrong. But I always keep a folding pruning saw in my pack to. I prefer this over those wire saw things, as you can use one hand to hold the branch or stick and the other to saw. The wire /cable saw need two hand to oscelate it to and fro. Also a danger of scuffed knuckles as you use it. I love your mission to keep bushcraft free from the gear mania. I liked some earlier posts on your twitter account adressing the same issue as well. The more knowledge/experience you have the less gear you will need. The only item I would second on this list is the head torch. I have two of those for my kids, but they are a bit unreliable in my opinion. On that note I would say you could do without a head torch all together, even as a beginner. 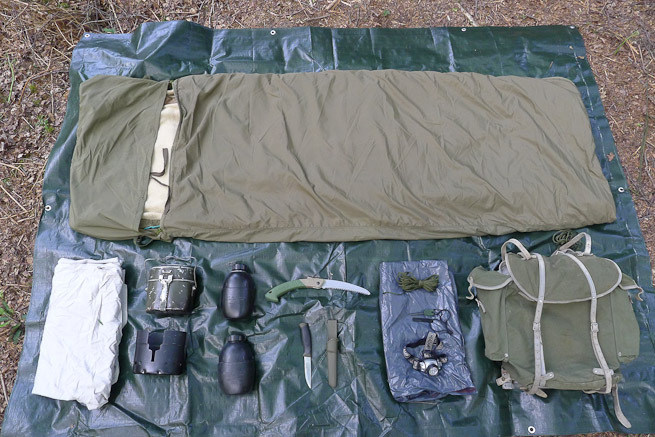 I know it’s an old blog post but I have always wondered if you managed to get the bedroll into the rucksack, I own one and it’s no small piece of kit. Here’s a suggestion that works for me . I put my roll mat vertically in my rucksack and then let it unroll making a wide tube with it forming a sort of inner wall to my rucksack . I then put all my gear in the now cavernous space in the middle. Good read, I’m aiming soon to just go out with a knife ( and a basha as I live in Wales) , whole idea of bushcraft is to utilise what’s around you, I have learnt to make spoons and forks out of willow fast, etc, weaving bark for string after boiling them, less kit you have the more you will learnt AND REMEMBER. I was excited to uncover this website. I wanted to thank you for ones time due to this fantastic read!! fav to check out new things in your blog. sort of great informative site. I would like to add that Hultafors make some decent, well priced ‘bushcraft’ knives but without he associated price tag. The Mora clipper is only around 2mm blade thickness, and a short tang so not altogether indestructible. For a further £5 the Mora heavy duty is much better. I have used and abused a hultafors heavy duty, batoning etc and cannot break it. At £6.99 on Heinnie.com it is a great buy. Easier for a beginner to keep sharp as well as it is scandi+secondary bevel. Lidl do a pruning saw 180mm for only £2.99 during gardening season, not going to last as well as a Bahco laplander or be as good, but you can buy 5 for the same price. As for the firesteel, search ‘huge ferrocerium rod’ on ebay, the ones from Malaysia or Philippines seem to work well and last forever. Roughly £3.50 but delivery will be a few weeks. THANKS FOR THE GREAT ARTICLES! 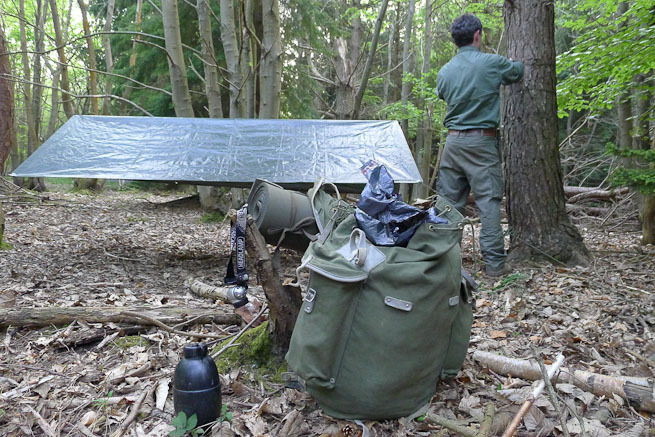 comments on Bushcraft on a Budget: All the Kit You Need for Less Than £100. look like they are coming from brain dead visitors? 😛 And, if you are posting on other online sites, I’d like to follow anything new you have to post. Great post! It gave me a nice place to start. I wonder what else went into the backpack and where you placed everything. Did you put extra clothes and food in the backpack? Hi blogger, i must say you have very interesting content here. I enjoyed this article very much. It had me smiling also. As an ex military man, I did laugh at the pro and cons (and some big myths) regarding Mil equipment. This article was superb at saying by sensible and get out there. Something in truth I have not done for a few years now. Anyway, well done on writing a no nosense, cut through the BS article. Fabulous, clear and very good advice. When I started and had no money, I outfitted myself with surplus. I had the advantage to know what to look for and know if it was going to be good because I had been in Army Cadets for four years. The trouble with surplus gear is its presence is transient in the market (my wonderful Norwegian Bergan as shown above is no longer available) and they are mostly bulky and heavy. So back to “but cheap, buy twice”, the standard (made in China) sleeping bags and packs are of adequate quality for the amount of usage a beginner will get, and bless them to wear it out and progress to better gear. I taught hiking and camping in the 70s to inner city kids in NYC , where we took the bus to the Catskills for the weekends. 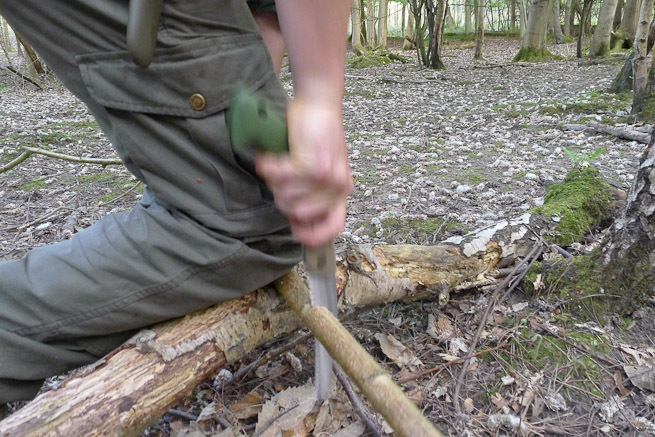 Start where most bushcraft courses finish and take your bushcraft skills to the next level. Gain all the paddling and bushcraft skills you need to make multi-day canoe journeys. Frontier Bushcraft Limited is a company incorporated in England and Wales with company number 7456133 and with its registered office at 20-22 Wenlock Road, London, N1 7GU.